Nitrates are inorganic ions that make their way into plant foods from the soil they grow in. They are also added to many processed foods. Excess nitrates in certain foods you consume may affect your health, but it is not yet determined what a safe amount is. How often you eat foods high in nitrates, the amount these foods consumes and whether you have certain diseases, all impacts whether the nitrates in foods negatively affect you. Nitrates form from the decomposition of nitrogen-rich waste present in soil and water. Plants that come into contact with nitrate-rich soil or water contain varying levels of nitrates. When farmer's add fertilizers with nitrates to crops, some of the nitrates move from the soil into the plants. The New Hampshire Department of Environmental Services indicates that the the average nitrate intake from vegetables for an adult is between 75 and 100 milligrams a day. Food manufacturers often add nitrates to processed meats such as hot dogs, luncheon meat, bacon, ham and sausages to enhance their color and shelf-life. A study featured in the May 2010 edition of the journal "Circulation" drew a correlation between processed meats high in nitrates and the risk of diabetes, stroke and heart disease. 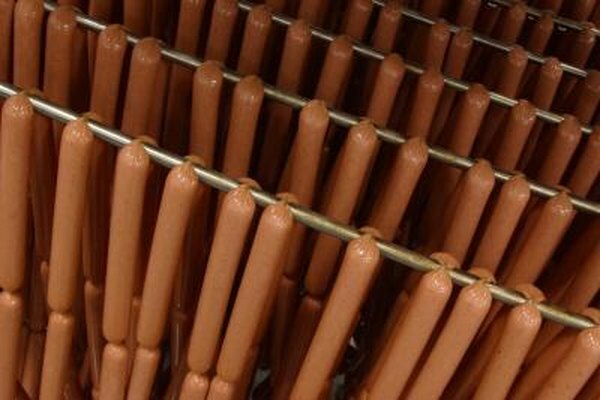 Another study published in the March 1994 edition of "Cancer Causes and Control" found a link between how often pregnant women consumed hot dogs and the incidence of brain tumors in their children, as well as a link between hot dog consumption and brain tumors in small children. If you choose to consume processed meat, limit your consumption to once or twice a month, or purchase nitrate-free varieties. Vegetables can contain nitrates, and over 70 percent of the nitrates the average adult consumes comes from nitrates in natural foods, according to the Agency for Toxic Substances and Disease Registry. The agency indicates that nitrate-rich vegetables do not normally give you dangerous levels of nitrates. Root vegetables, such as potatoes or carrots, contain more nitrates than plants grown above the ground. Other vegetables often higher in nitrates include spinach, broccoli and cauliflower. Additionally, any produce that comes in contact with either nitrate-rich fertilizer or animal feces contaminated with nitrates, may contain high levels of nitrates. Agency for Toxic Substances and Disease Registry also advises that nitrates can contaminate some drinking water supplies. The agency notes that about 1.2 percent of wells in small communities and 2.4 percent of wells on private land have unacceptable levels of nitrates in the water. Rural areas that are rich in agricultural farming often have higher incidences of nitrate contamination. Infants who consume formula or baby food made with nitrate-rich water risk developing blue-baby syndrome. According to research published in the July 2000 issue of "Environmental Health Perspectives," this syndrome can cause severe illness and even death, if it is not treated promptly.